Long gone are the days when the dupatta was all about ‘Laaj’ and ‘Haya’. In the 21st century, it has gone beyond just making the bride look docile and is the perfect way to drastically amp up your look (yes, without Botox). Adding dollops of oomph to your ensemble, it transforms your once- or twice-worn anarkali or lehenga into a spanking new outfit. Whether it is heavily embellished or light-bordered, quirky or printed, smartly -draped beauties can give you a kickass look. While you may know the conventional drapes, here are a few dupatta draping styles that we’ve compiled just for you! This is a very classy style of draping your dupatta, especially on the wedding day. 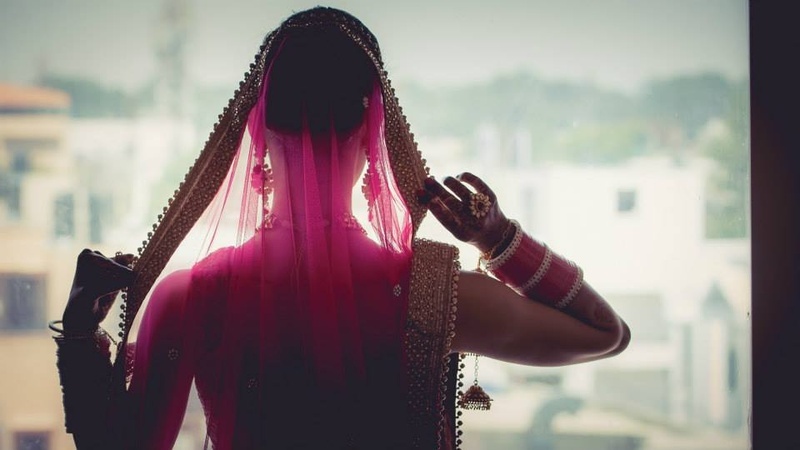 Cover your head from the mid of the dupatta, bringing in front the sides on the shoulders. This style covers you up in the intricate dupatta. It can be teamed up with a plain choli or kameez for a chic appeal. Mostly worn by the Begums, this style is generally adorned by Muslim brides but has made a beautiful comeback with Kareena Kapoor displaying the same look on her wedding day. Remember how she wore Sharmila Tagore’s sharara for her wedding? That’s the look we’re talking about. It’s regal, isn’t it? So, the dupatta you choose for this look should have a heavy lace border or gotta work. Add to your look by wearing an elegant kite or round crystal maang tikka with or without a jhoomka. A beautiful style to drape your wedding dupatta is the one which covers your head while creating a dramatic look by bringing in one side of the dupatta in a front U-shape. For this style, a net dupatta with a heavy zardozi or stone-work border will give you an elegant look. You can wear a big maang tikka or maatha patti to stylize your outfit and create a style statement on your big day. As this style makes your sleeves visible, you can wear a blouse that has beautifully-embroidered sleeves. Half sleeves till the elbow will be a nice way to show off your beautiful arms that are adorned with mehendi. Take a net, sheer or tissue dupatta that matches your wedding outfit and drape it in a Gujarati saree style. You can drape this style by keeping the flared dupatta on the front pinned on one side of the waist on your lehenga. The other dupatta, which is your lehenga’s matching piece, can be pinned over the bun. Very chic, this style is a mix of traditional Gujarati dupatta draping with a modern way of covering your head. A retro style bun is the perfect way to create that outstanding appeal you want to make for your wedding. Don’t want to cover your luscious locks on the wedding day? Try this saree drape that will make you look elegant and keep your wedding day look memorable. Use your bridal dupatta, which can also be your lehenga’s dupatta to create the look. Gently tuck one corner of your dupatta on one side of the lehenga and drape the other half like a saree. Isn’t it easy? This simple yet modern style lets you create amazing looks that can be worn for your reception party or even at the cocktail! This is also a nice way to drape your dupatta for the wedding day! A long dupatta gorgeously laid on the head, where its other end is tied on the wrist. A heavy, fully-embellished or banarsi dupatta works well to create this look. You can team it up with either a long sleeve kameez or a waist length top with minimal embroidery. A nice side bun adorned with a jhoomar will also add to the regal essence of the attire. You can use two dupattas to create this look. One dupatta can be used to cover your head in a royal way; whereas, the other dupatta can be spread out in a front deep U shape. A sheer dupatta looks lovely for this style. A nice jadau necklace with big earrings and maang tikka will add that glamour to the outfit you always wanted. In this look, you can take one dupatta and cover your head from one corner and drape it on one shoulder in pleats. You can also drape it in multiple pleats if the dupatta is broad enough, otherwise two folds are also enough to get that look. A prominent style, it allows you to show off your bridal haar and other heavy jewellery. You can also take your hair on the opposite side of the dupatta to create a modern look. A classy look to show off your slim waist! Yes, this is the ideal style if you want to flaunt that figure after spending months in the gym. For this style, you can use a sheer light dupatta on the head and use classic jewellery like a classic maatha patti or maang tikka. The other dupatta can be pleated and secured with a kundan or diamond kamarband. A short blouse in half sleeves looks best for this look and will surely make you a glam bride! This is an ultimate style of draping your dupatta for your reception. A plain, short choli or blouse that is covered by a sheer dupatta in V-shape is perfect for a classy appeal on your big day. You can highlight this look by wearing a vintage choker or the long multi-string pearl necklace. A classic bun or even open hair looks great with this dupatta draping style. This style could be one of the simplest ways to drape your dupatta on the wedding day. But we still love it as it gives us that ethnic Indian look when worn with a lehenga. So, you can create this look by draping the dupatta from back to front where the front looks similar to our style #3. Heavy border dupatta looks best for this look when teamed with a stylish blouse. You can also stylize this outfit by wearing a polka haar and matching jewellery. Guys, we have covered all possible ways! Tempted to try them? Go on and indulge in some drama as you drape your dupatta the fun way.